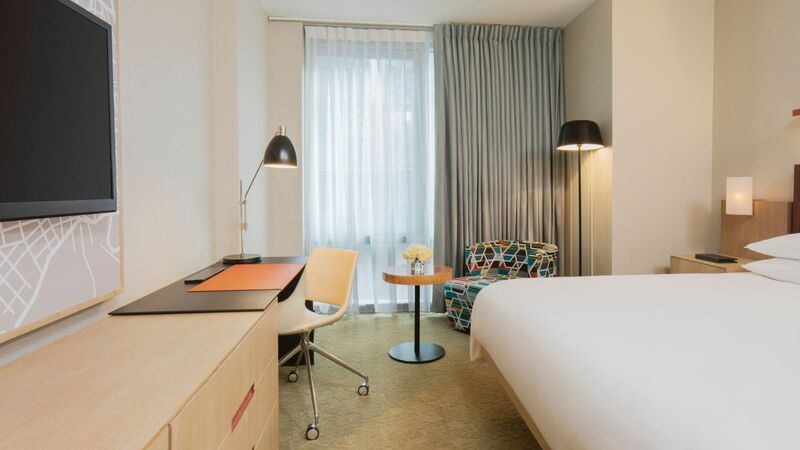 Enjoy a modern luxury experience at our Manhattan hotel in one of the 487 well-appointed rooms. This 825 sq ft suite features a 250 sq ft private balcony, floor-to-ceiling windows, and stunning views of Times Square. This one-bedroom suite includes a king-sized bed. Experience modern luxury and spacious comfort in a 595 sq ft suite with separate lounge space and a seating area for work or entertaining. This is a standard suite. See World of Hyatt program terms for upgrade eligibility. See stunning views of Times Square in a deluxe suite that has a king bed and separate lounge area. This 500 sq ft suite has a pull-out sofa sleeper in the lounge area, a separate soaking tub, rain shower. Located on the 44th Floor and above. 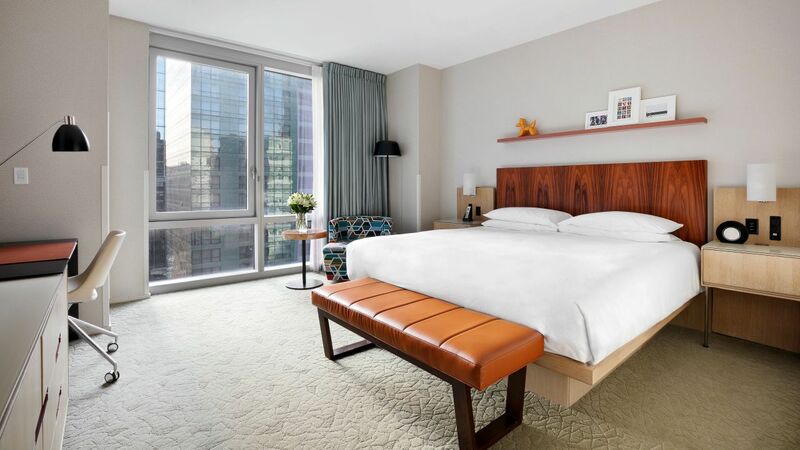 Upgrade to this 460 sq ft, king-bedded guestroom featuring floor-to-ceiling windows that overlook the Chrysler Building. Suites located on the 40th floor and above offer views of the Chrysler Building and Freedom Tower. 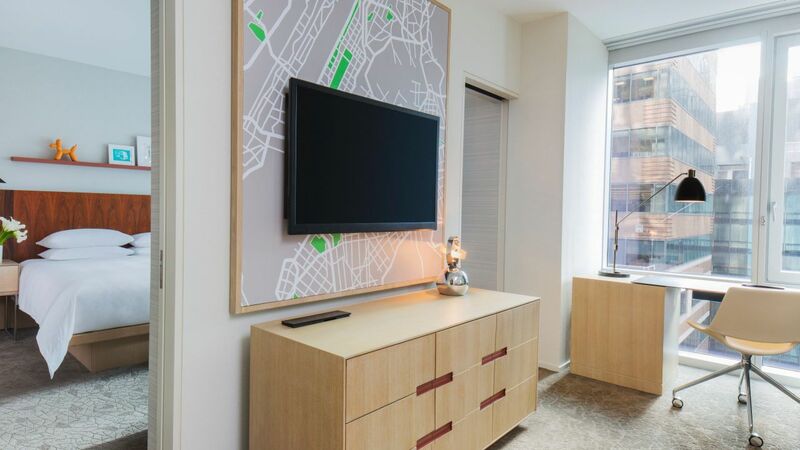 Enjoy stunning views of Times Square in a 460 sq ft room with a separate lounge space, and chic décor. This is a premium suite. See World of Hyatt program terms for upgrade eligibility. Located on floors 41 – 46. Experience a unique view of the city from your own private terrace, stemming from your 325 sq ft guestroom. 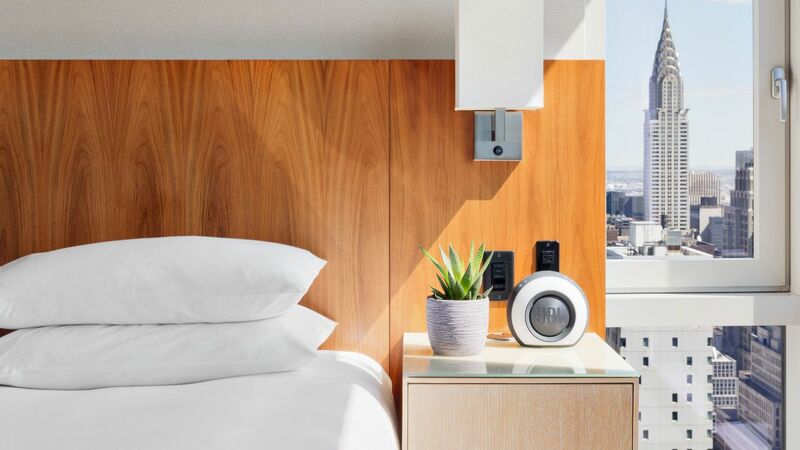 Experience a lofty view of the city from a well-appointed guestroom with modern features, set amid 460 sq ft.
With chic furnishings, urban-inspired artwork, and views of Times Square from the 41st floor or higher, our 340 sq ft room feels like an elegant home away from home. 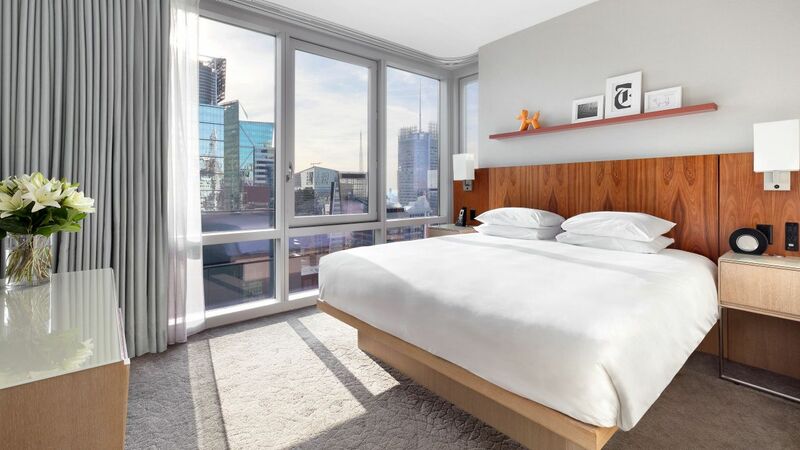 Enjoy New York in a 325 square foot room and floor-to-ceiling windows with north-facing views of Manhattan. 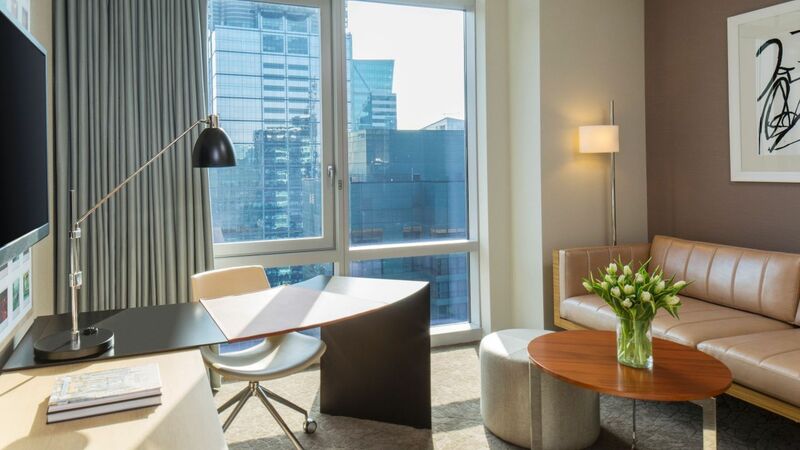 Our High floor rooms are located on the 27th floor and above. 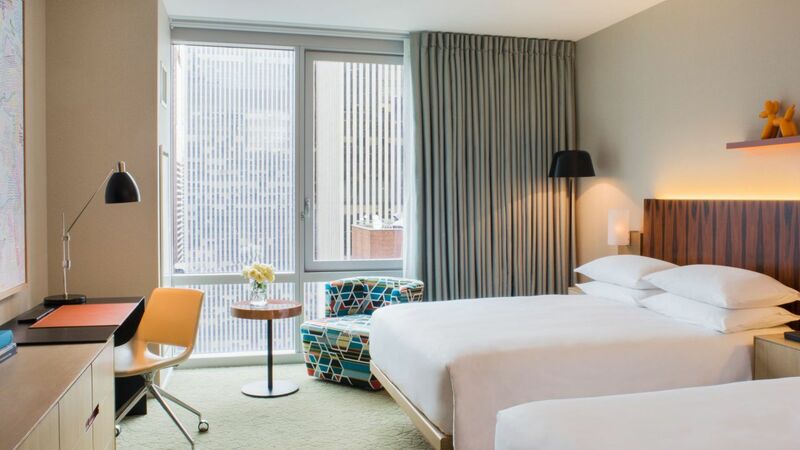 See views of the Times Square area in our spacious 325 square foot room with floor-to-ceiling windows. View King rooms are located on the 20th floor and above. 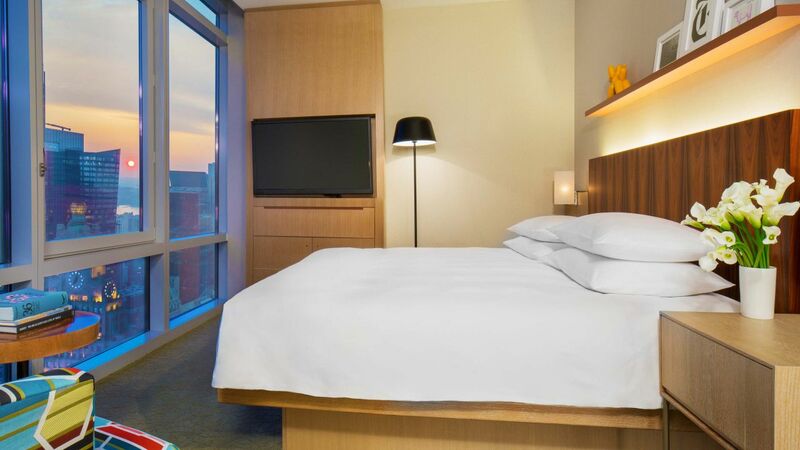 Relax in a spacious 325 sq ft guestroom with one king Hyatt Grand Bed™, large flat-screen TV and floor-to-ceiling windows. 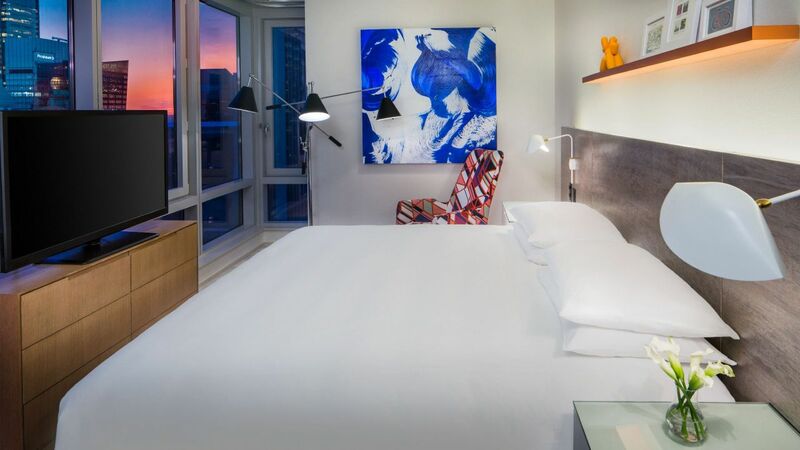 Take in amazing views of the city from this spacious 350 sq ft room with chic décor, flat-screen TV and comfortable pillow-top bed. 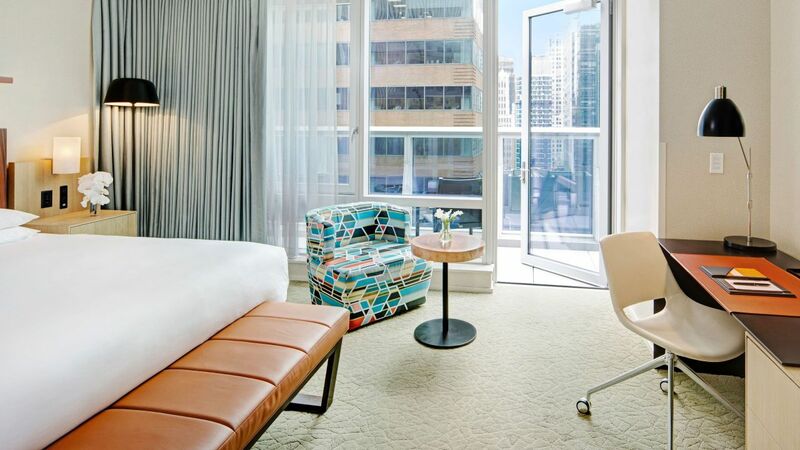 Enjoy breathtaking views of the city in this luxurious 325 sq ft guestroom, featuring modern décor and fully accessible features. Relax amid chic comfort in a 375 sq ft guestroom featuring elegant, modern décor and fully accessible features.